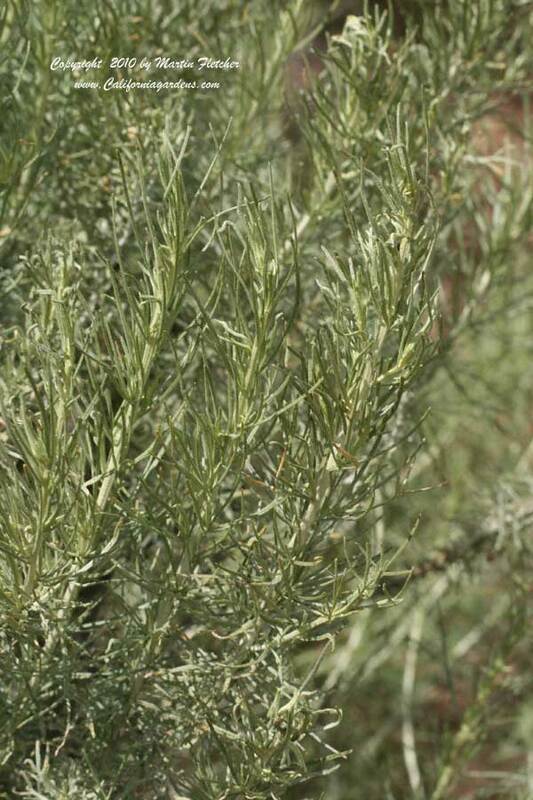 Artemisia californica brings a warm fragrance to the garden whenever the sun shines on the gray foliage. The California Sagebrush foliage brings a soft texture to the landscape. Artemisia californica is a major component of the Coastal Sage Scrub plant community that is increasingly being replaced by houses. Making pockets of native plants brings in the birds. They are attracted to the plants they recognize. Artemisia californica grows four feet tall and wide. In the wild, fire makes these plants start over fairly frequently. In the landscape periodic hard pruning can accomplish the same effect. I periodically cut back a few of the branches to near the base so the California Sagebrush plants are constantly regenerating. The selected variety Artemisia californica Canyon Gray grows as a trailing groundcover. Artemisia californica is Winter hardy into the low 20°s F.
Flowers and foliage of Artemesia californica the California Sagebrush. High resolution photos are part of our garden image collection.